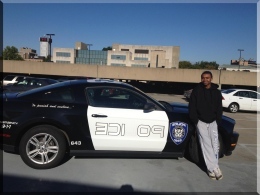 Brandon Heard, sophomore, poses on top of the M-2 parking deck with his Ford Mustang he transformed into Barricade, a character in the movie “Transformers.” He drives the car to school every day. Photo by Sarah Thomas/The Jambar. Driving around in a transformer tends to evoke a plethora of reactions from onlookers: looks of confusion, perplexed stares and gawking. For Brandon Heard, a sophomore electrical engineering major, these all are part of his daily commute to school. The transformation is still underway, but so far the car says “police” backward on both doors and has police decals on both sides of the car and the roof. Heard said he eventually plans to add police lights to the roof and a bull bar to the front. He also wants to trade in the decals for a vinyl paint job. Heard has been pulled over 15 times in the one and a half years since the transformations began. “Do you know how many state troopers have not seen ‘Transformers’?” Heard asked. Heard’s run-ins with the law tend to be more related to speeding — and not to his vehicle’s appearance. But when he does get pulled over, multiple police officers always arrive on the scene. “There’s never just one officer,” Heard said. He said as many as five cars have arrived on scene at once to gawk at his means of transportation. Even strangers find the car controversial. Barricade often turns heads on campus, too. But Heard said he’s gotten used to the stares. The Mustang was not Heard’s first choice of car. Initially, he wanted to get a Chevrolet Camaro. The Camaro is still on his list, though, along with approximately 20 other cars he would like to purchase. In November, Heard bought a motorcycle, which also plays a key role in the “Transformers” movie, and he plans to get a Pontiac Solstice in the near future. Once Heard acquires the Solstice and finishes transforming the Mustang into Barricade, he plans to retire it as a show car. He said it would be too risky to drive around with police symbols, police lights and a bull bar.